CarteNav Solutions Inc., the makers of AIMS mission system software, is pleased to announce the appointment of Lee Marshall to the newly created position of Director of Training Services. “Mr. Marshall brings extensive operational experience in airborne policing, training, and course design and delivery,” said Paul Evans, CarteNav’s president. Mr. Marshall began his career as an instructor in the British Army, specializing in weapons and tactics. After joining the Police in 1990 he had various roles until in 2004, he qualified as a Tactical Flight Officer (TFO) and a year later became a Tactical Flight Training Officer (TFTO). More recently, Mr. Marshall became instrumental in the development and delivery of a new airborne mission system working closely with various teams and stakeholders, whilst also being responsible for the design and delivery of the integration course, which received national accreditation. Mr. Marshall retired from his previous role at the start of September. Initially, Mr. Marshall will be working closely with CarteNav’s VP Business Development and VP Service while he develops a flexible training strategy to meet the requirements of both new and existing customers. “I am looking forward to new challenges and I'm excited at the opportunity to work with such a dynamic and professional group of people, and I look forward to contributing to the future growth and success of CarteNav,” said Mr. Marshall. 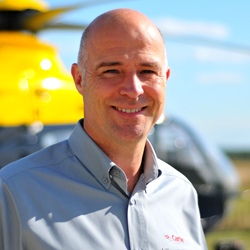 One of his first duties in his new role will be as part of CarteNav’s team at Helitech International, a major helicopter expo and conference in Amsterdam on 11-13 October. Mr. Marshall joins CarteNav at a key stage in the firm’s evolution with the company having recently become a wholly owned subsidiary of Provincial Aerospace Ltd, and part of the Exchange Income Corporation (EIC) group of companies. CarteNav Solutions Inc. is an international leader in mission management and sensor management software solutions for airborne, land, and maritime environments. CarteNav offers operationally proven software that dramatically improves the performance of both sensor operators and tactical decision makers. The company has established a reputation for providing sought-after and high-value software solutions that can be deployed on a wide variety of platforms supporting multiple mission types for a diverse client base that includes government, military, and commercial customers. CarteNav is a wholly-owned subsidiary of Provincial Aerospace Ltd. and part of the Exchange Income Corporation (EIC) group of companies.